If you’re hungry for adventure and love outdoor-related activities, then this sounds like just the thing. The Mercedes-Benz Hungry for Adventure Festival happening this weekend promises the chance to get up close with a couple of the brand’s new SUVs as well as partake in a host of exciting outdoor activities. The event, which runs from March 22 to 24 at Sentul Depot in Kuala Lumpur, will showcase a new C253 GLC Coupe variant, the GLC 300 Coupe, and there will also be an exclusive preview of the all-new W167 GLE 450. Visitors will also get a chance to test drive the range of Mercedes-Benz models at the event. Outdoor and sports activities will include reverse bungee jumping, flying fox and rock climbing, as well as a virtual cycling challenge by Cycology. Kids aren’t going to be left out, with an inflatable playground and a miniature driving town set to keep the little ones busy. Elsewhere, there will be no shortage of food trucks to sate appetites. Away from the vehicles, the highlight of the event will be the Hungry for Adventure Live concert on March 23 at 6 pm, with music from Craig David presents TS5, BATE, MC VIBE, CZA and Electronic Theatrical Music, along with a freestyle rap and DJ battle. Entry to the concert is by invite-only, but you can receive free passes to the concert by attending the Hungry for Adventure Festival on March 22 and 23 and test driving any of the Mercedes-Benz vehicles at the event. Passes will be given out, but these will be on a first-come, first-served basis, and there will only be a limited number to be given away each day, so be fast about it if you want one. 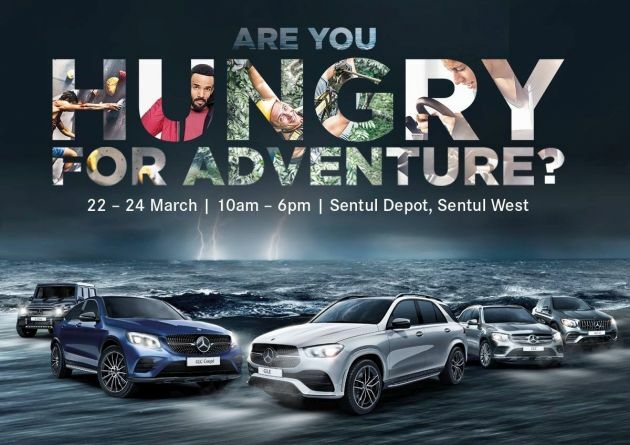 The Mercedes-Benz Hungry for Adventure Festival will be held at Sentul Depot, Sentul West on March 22 to 24 from 10 am to 7 pm daily. For more information, visit the event page on Facebook. The post Mercedes-Benz GLC300 Coupe and all-new GLE450 – catch them at the ‘Hungry for Adventure’ Festival appeared first on Paul Tan's Automotive News. 0 Response to "Mercedes-Benz GLC300 Coupe and all-new GLE450 – catch them at the ‘Hungry for Adventure’ Festival"